We had very mixed feelings about our GlowHost web hosting experience. On the positive side, the cheapest plan provides a number of unlimited features as well as industry best-practices standards like the cPanel control panel, and the Softaculous applications installer. Further, reliability testing resulted in a 100% uptime rating. On the downside — we found GlowHost pricing practices to be somewhat deceptive as renewal pricing information is not provided until Step 3 of the checkout process. Further, testing indicated only average page-load speeds. On balance GlowHost has earned 4 stars and the NCM Online designation of RECOMMENDED WITH RESERVATIONS..
A Better Business Bureau accredited company with an A+ rating, GlowHost has provided web hosting services to more than 1,000,000 websites since 2002. The firm has established an international presence through the use of carrier-neutral datacenters in North America, Europe, and Asia. GlowHost offers four shared hosting plans — two unlimited plans (Unlimited Single Domain and Unlimited Multi-Domain) and two performance and feature enhanced, but limited plans (Personal Hosting and Professional Hosting). They range in price from $6.95 per month to $18.95 per month for a 1-year term renewal. All GlowHost shared plans are backed by 24×7 technical support (chat, e-mail/ticket) and a 91-day, money-back guarantee. The cheapest unlimited plan — Unlimited Single Domain — features unlimited disk space, unlimited bandwidth, the cPanel control panel (screenshot below right), the Softaculous apps installer, 300+ ready-to-install applications, the Basic Soholaunch Web Site Builder, a free domain name for the life of your account (for 1- and 2-year plans), and more. Screenshot of GlowHost cPanel 11 control panel. Click to enlarge. Unlimited Single Domain renewal pricing options include $4.95 per month for a 2-year term, $6.95 per month for a 1-year term, $8.95 per month for a 6-month term, $8.95 per month for a 3-month term, and $8.95 per month for a monthly term. To confuse matters further, the 2-year, 1-year, and monthly plans receive a 50% discount for the first term only. 3-month and 6-month terms are not eligible for the 50% discount and renew at the initial rate. The higher-priced unlimited plan — Unlimited Multi-Domain — includes the same features as the Unlimited Single Domain plan, while adding the ability to host an unlimited number of websites on a single account. Unlimited Multi-Domain renewal pricing options include $8.95 per month for a 2-year term, $9.95 per month for a 1-year term, $10.95 per month for a 6-month term, $10.95 per month for a 3-month term, and $10.95 per month for a monthly term. Like the Unlimited Single Domain plan, the 2-year, 1-year, and monthly plans receive a 50% discount for the first term only. 3-month and 6-month terms are not eligible for the 50% discount and renew at the initial rate. The cheapest performance and feature enhanced limited plan — Personal Hosting — includes the same features as the unlimited plans while adding the Pro version of the Soholaunch Website Builder, and FFmpeg support. It also limits disk space to 10GB and bandwidth to 100GB. Personal Hosting renewal pricing options include $7.95 per month for a 2-year term, $8.95 per month for a 1-year term, $9.95 per month for a 6-month term, $9.95 per month for a 3-month term, and $9.95 per month for a monthly term. All Personal Hosting plans receive a 50% discount for the first term only. The higher-priced performance and feature enhanced limited plan — Professional Hosting — includes the same features as the Personal Hosting plan, while adding a “free” Comodo SSL Certificate (1-year and 2-year plans only). We placed “free” in quotes because you will be billed a one-time, $39.00 installation fee. It limits disk space to 20GB and bandwidth to 250GB. Additional features of the Professional Hosting plan include a free dedicated IP address as well as free Sucuri malware and anti-hacking protection (6-month, 1-year and 2-year plans only). Professional Hosting renewal pricing options include $17.95 per month for a 2-year term, $18.95 per month for a 1-year term, $19.95 per month for a 6-month term, $19.95 per month for a 3-month term, and $19.95 per month for a monthly term. Like the Personal Hosting plan, all Professional Hosting plans receive a 50% discount for the first term only. Screenshot of GlowHost shopping cart during Step 3 of the checkout process. Note that there is no indication that shared web hosting plans renew at the regular and not the discounted price. Click to enlarge. Confused by GlowHost’s features and pricing? We certainly were. To make matters worse, the shared hosting page make no mention of the fact that most of the prices displayed are for the first term only, and renew at approximately 200% of the initial cost. After unsuccessfully searching the site for renewal pricing, we utilized chat support only to be informed that the regular pricing would be displayed in the shopping cart after we clicked the “Order Now” button. The support rep was correct. Discounted and regular pricing were displayed in the shopping cart. However, there was no indication that shared plans renew at the regular — not the discounted — price. See screenshot right. While we would prefer not to dwell on negatives, we found GlowHost’s pricing disclosure policies to be both confusing and at least somewhat deceptive. NCM Online has and will continue to point out any less-than-transparent business practices employed by the web hosting companies we review — wherever and whenever we encounter them. Further we have and will continue to deduct from the ease-of-use and satisfaction ratings of any host that utilizes such practices. GlowHost’s ratings have been adjusted downward accordingly. As is our practice, we purchased the lowest-cost shared hosting plan — Unlimited Single Domain — for review and testing purposes. Beginning at the “Shared Hosting Services” page, we selected a hosting term from the pulldown menu and clicked the “Order Now” button. GlowHost utilizes a less-than-consumer-friendly, five-step ordering process. The first step is to register a new domain name (free with all shared 1- and 2-year plans) or enter a domain name you already own. We entered the domain name for our test site and clicked the “Continue” button. The second step is to decide whether or not you would like to purchase a domain name similar to the one entered in the previous step by selecting a domain name from the list presented. Making use of this step is entirely optional. We did not make a selection and clicked the “Continue” button. The fourth step requires the entry of contact details and agreeing to the Terms of Service. We entered the obligatory information, checked the TOS box and clicked the “Continue” button. The fifth step permits you to select from a choice of three payment methods (credit card, PayPal, and Bitcoin), as well as the option to add billing information — if different from the contact information entered previously. We selected the PayPal option, clicked the “Continue” button, and submitted our order. GlowHost Uptime Test Results Chart. Click to enlarge. A few seconds after placing our order, the PayPal e-mail receipt and the GlowHost “Welcome” e-mail arrived in our inbox simultaneously. We were pleased to see that the latter included the information required to quickly set up our test site. The message provided all of the pertinent hosting details and then some. It included the Account Manager login, the nameservers, cPanel login, FTP settings (standard and secure), e-mail settings, (POP3, IMAP, and SSL), webmail login, and more. Using FTP, we proceeded to upload our 1-page NCM test site. 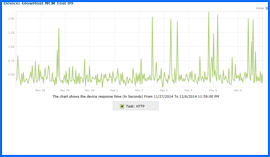 We then set up the Dotcom Monitor page-load speed and uptime testing, and waited for the test results to accumulate. GlowHost Speed Test Results Chart. Click to enlarge. All web hosting services reviewed by NCM Online are purchased and subjected to our 10-day test for speed and reliability. GlowHost testing began on 11/27/14 and concluded on 12/06/14. 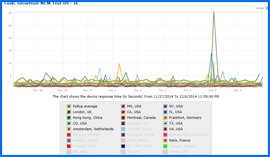 Our test site was checked for page load speed and uptime every 15 minutes from 13 worldwide locations. In all, testing consisted of nearly 2000 individual server checks. We are pleased to report that Dotcom Monitor testing resulted in a perfect 100% reliability score. See uptime test results chart above right. Although reliable, our Unlimited Single Domain shared web hosting plan did not rank amongst the fastest services reviewed to date. GlowHost scored an only-average, 10-day average speed of 1.6334 seconds to load our simple, one-page test site from 13 locations worldwide, and 1.1900 seconds from 7 U.S. locations. Unfortunately, this resulted in a mediocre 3-star speed rating. See screenshot above right for test locations and results chart. See our Fastest Shared Web Hosts page for the speed ratings of other hosting services reviewed. If not for their less-than-transparent pricing disclosure policies, GlowHost would have easily earned 4.5 stars and our “recommended” rating. On balance, GlowHost has earned 4 stars and is currently recommended with reservations by NCM Online. Cheap website hosting company price comparisons based on 1-year term list price before coupon/promo codes or limited time/introductory offer discounts. These are the renewal rates for the second year of hosting. To ensure that you receive the most affordable GlowHost pricing possible, please see Summary above for coupon code and/or current discounts before making any purchases. Created over a decade ago, Glowhost has always implemented a unique webhosting approach and has since supplied a well-operating system that is an invisible backbone behind domains around the world. The company expertly offers affordable and dependable web hosting for enterprise, business, and personal use of many scales and types in almost every country worldwide. To ensure the best webhosting experience, GlowHost maintains quality staffing guidelines with a big emphasis on training. Their on-site Technical Team is highly practiced with centuries of combined experience among them. Customers can contact them at any time of the day, any day of the year. There is no guesswork involved for customers hosting with this firm. The company has tried and tested many solutions to a multitude of webhosting needs and discovered which are best. Being around for a decade has allowed the company to partner up strategically with other companies to provide many options for common hosting needs. They have also established purchasing relationships on a large scale to allow customers access to savings. GlowHost utilizes state-of-the-art hardware including Intel Processors, HP StorageWorks storage area networks, server-grade memory modules and hard drives, CISCO routing equipment and switches, and more. They do not cut corners when considering their hardware’s quality. This hardware is housed in numerous premium neutral datacenters in the United States. The datacenters hosting their servers are among the most reliable in America. The AtlantaNap datacenter allows the servers to be fed downstream and upstream through many Tier 1 network providers simultaneously because of its location on Atlanta Internet Exchange. This “multi-homed” bandwidth is redundant and of high-quality, something offered by a limited amount of webhosting providers at such a reasonable cost. Their datacenter in Dallas also has this multi-homed bandwidth offering differing types of bandwidth choices for customers. GlowHost’s Technical Analysts work in offices around the US and in Europe, and the company’s call center is fully based in America. The firm does not provide the absolute cheapest webhosting due to their American location. The on-site services and staff and quality hardware could be cheaper if they outsourced to overseas support and call centers. Web site reliability, expert detail-attentive customer service reps, and peace of mind will easily override the minute price difference with the cheapest host. They guarantee satisfaction or a customer can get their money back within 91 days. GlowHost believes that with its American hosting support and top-notch American datacenters, it can provide website hosting needs for any customer. This ranges from hosting a single website to having a dedicated, fully managed server with cloud clusters for expansive websites. The company also gives back. Startup non-profits in America are offered free webhosting. The firm maintains a forever evolving Green Hosting Initiative to maintain its status as environmentally responsible. They are always looking to reduce their carbon footprint. They have a Paperless Billing Program that is able to prevent the emission of thousands of lbs of carbon dioxide each year. Avoiding traditional paper billing also prevents the use of many trees for envelopes, paper, and stamps. Also, no fossil fuel emissions are produced nor fuel consumed by delivery vehicles replaced by the electronic delivery. Post-consumer waste is reduced with recycling stations. GlowHost, as an accredited member with the Better Business Bureau, has an A+ rating. This video tutorial demonstrates the installation of WordPress on a GlowHost shared hosting account using cPanel and the Softaculous applications installer.